Meet IIH and stay updated with the latest digital trends and knowledge at our events. We take pride in sharing the latest knowledge within the strategy, digital marketing, analytics, machine learning, trends, and tendencies. We frequently invite external speakers, both from Denmark and abroad. Below you find the list of upcoming events as well as review pages of previous events at IIH Nordic. Don’t miss out on our future events – subscribe to our events newsletter here! 24 April Digital Strategy Network Group Digital Strategy Network Group is for senior business professionals who need to be at the up to date with the latest with online and digital technologies, to implement into business operations and strategies. IIH Nordic invites to a Morning Brief on the 8th of May, where you in a few hours will gain insights on how to work with your SEO and conversion optimization. The SEO & CRO team at IIH Nordic will bring insigths on the work with SEO and CRO and bring in a customer case on improving the conversion rate. 12 juni CxO Digital Update The CxO Digital Update held at the Confederation of Danish Industry (DI) is an evening event to give business leaders in Denmark, the latest trends and insights that are critically important for these companies to lead in their markets in the digital ‘on-line’ age. Contact Events@iihnordic.com if you think this is something for you. 23 October Web Analytics Wednesday Don’t miss out on Denmark’s biggest free analytics event – an international networking happening! 20 March Mornig Brief: Online Advertising Update Review IIH’s paid media team joined by speakers from Nilfisk and Strossle presented some of the latest trends that companies and brands need to be aware of. This half day workshop was a direct interactive learning forum with Simo Ahava and Google Tag Manager. His 12+ years of industry experience from both sides of the proverbial table (marketing and software development) will be of great use to senior professionals working in data analytics, marketing, and business strategy. Don’t miss out on Denmark’s biggest free analytics event – an international networking happening! IIH Nordic hosts Web Analytics Wednesday four times a year – a free event for digital analytics and marketing people with speakers both from Denmark and abroad. 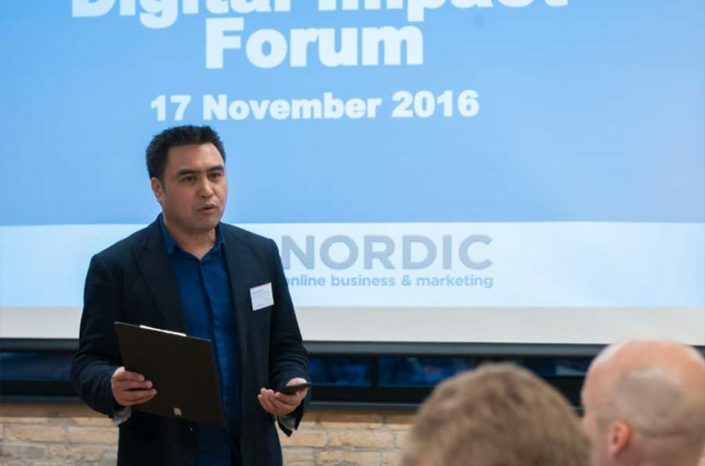 Digital Impact Forum is a biannual event, that gathers some of te leading voices within marketing and communication within the Nordics. The speakers share their experiences with a specially invited audience. MeasureCamp is an unconference created by analytics people, for analytics people. IIH Nordic has hosted the annual MeasureCamp in Copenhagen since 2017, at our beautiful locations at Islands Brygge.